Do they accept? If they do will they be able to defeat the trials and tribulations that await them? Will they find treasure and glory, or suffer defeat at the hands of the vile and depraved Stakeholder? The only way to find out if our heroes will complete this epic quest will be to join us and see if the dice of fate will be kind to them! Along the way we will will learn some truths about feature implementation and how our heroes handle the challenges that lie ahead. And hopefully gain enough experience to level up! This is an extremely unique talk! It takes the form of a live Dungeons & Dragons game. I will be on stage playing the part of Dungeon Master looking to guide our team of adventurers through the process of delivering a new feature for a project. Our heroes currently consist of a heroic bard who will be inspiring our heroes, and audience, with ballads of past glories. A warlock with the demonic power to fork and merge code like no other in existence…. Our sorcerer has the innate and wild magic of Fire(base)! Finally our team is held together with the support of our cleric, worshipping the ancient god Rasmus. The outcome of this adventure will genuinely be determined by the roll of the dice! It will be a game of 5th edition D&D that we can probably fit into an hour… but 2 or more would be better and far more fun. Audience participation is expected! Cosplay is hoped for! I will, of course, be in full scout uniform! I stood up in front of a group of developers and gave a lightning talk about how Scouting Principles should be applied to every day development. The amazing thing is that I didn’t get any rotten tomatoes thrown at me! quite the contrary in fact. 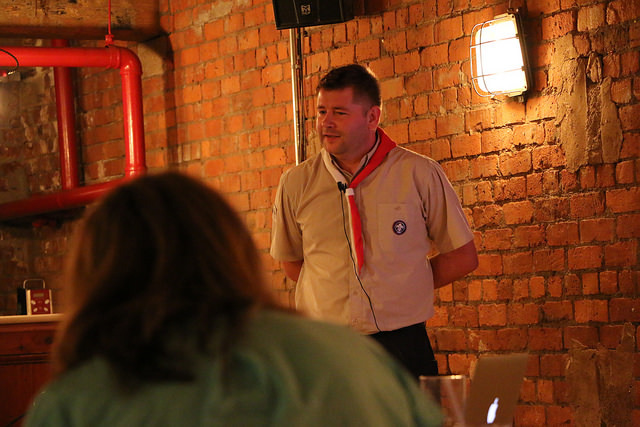 Even with me doing the talk in full Scout uniform. Now to see about finding some more places to speak and actually fleshing out the talk into something that can last a full hour and not just shy of 5 minutes.